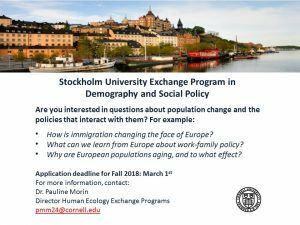 Stockholm University Exchange Program in Demography and Social Policy. 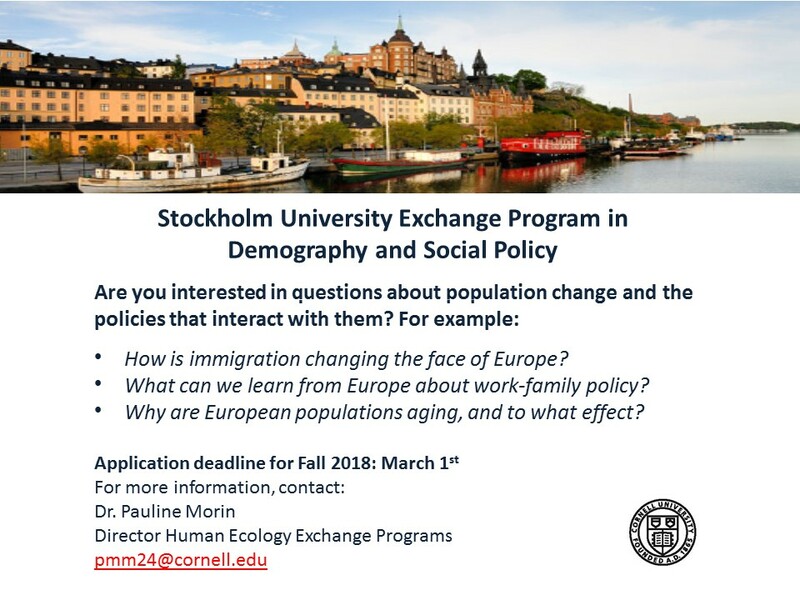 Undergraduate students interested in demography and social policy may spend one semester, and in some cases up to two semesters, studying at Stockholm University. If you have questions about the program or would like additional information about applying, contact Dr. Pauline Morin, Director of Exchange Programs Human Ecology. Note: For Spring 2019, application deadline is September 30, 2018. Summer Program in Turin, PAM 3620 Population Dynamics and Policy Debates in Comparative Perspective (3 credits). This course explores the causes and consequences of population change, paying particular attention to how population processes interact with the social, economic, and political context in which they play out. DIS Copenhagen and Cornell University, Child Development Summer Course (4 credits). Gain a Nordic perspective on education and “the good childhood.” Combine classroom and experiential learning through learning lab immersion at summer camps and community organizations. For more information, contact Kim Kopko.